Scarprin for sale in Malaysia. Treatment for Keloids, Hypertrophic, Surgery, Burn Scars. Cream or gel to remove Keloids, Hypertrophic, Surgery, Burn Scars. Scar Cream : Scar creams can contain a variety of ingredients including silicone, onion extract and vitamins. Typically, scar creams contain a variety of skin moisturizers. While using a scar cream can help heal a scar, our staff believes that using a scar gel is a more effective option. Scar Gel : Very similar to scar creams, scar gels can also contain a variety of ingredients but are generally silicone based. Silicone scar gels are the most effective way to help diminish the size and color of a variety of scars including burn scars, surgery scars, plastic surgery scars, and Keloid scars. Furthermore, scar gels absorb into the skin more efficiently than scar creams which is why our organization suggests purchasing a silicone scar gel over a scar cream. Keloids: Keloid scars are part of the unique hypertrophic scar family in that they can actually grow. Unfortunately, Keloids are considered the most serious type of scar because they are the only type of scar that can literally expand beyond the boundaries of the scar area. While some may assume that the only way to get rid of a Keloid scar is through surgery, the reality is that surgically removing a Keloid scar results in the formation of another Keloid more than 50% of the time. Thankfully, there is a variety over-the-counter Keloid Scar Treatments available. Keloid scar removal using a topical scar treatment will require patience, but it is possible and suggested by a variety of plastic surgeons and skin care professionals. Plastic Surgery Scars: Thankfully, scars that result from plastic surgery including tummy tuck scars, breast augmentation scars, and liposuction scars are generally small. Plastic surgeons will typically supply their patients with either a silicone scar gel and or silicone scar sheeting after their surgery. Our team believes that silicone scar treatments are the best option because they naturally conform to the body whereas silicone scar sheeting may lose contact with the body when it moves. This is especially true concerning scars that are on parts of the body that are constantly moving. Scar Products: As previously stated, there are many different scar removal products to choose from including those listed above in our review grid. Choosing a safe and effective scar product should be taken very seriously as the wrong choice may significantly delay the healing process. Thankfully, the best scar products are easily available through our online store and can provide scar therapy in the privacy of one's home. Keeps moisture around the wound. Speeds healing. Fast healing cuts scar formation. Silicone is an infection barrier. Infection stops normal healing, which means more scar tissue piles up. Silicone reduces scar color and size. It’s used by doctors following scar surgery. Doctors recommend it for home scar treatment. This is an older, homeopathic remedy. It was tested at a Texas hospital. Redness, itching and scar size stayed the same. This was also part of the Texas hospital test. It proved worthless for scars. It could help your overall health. Collagen is bad. It’s what makes scars bulge. It may be fine for indented scars. It easily breaks down if it comes in contact with any other substance. This is the juice of a sticky bush, used to cover wounds. So there is some protection. The Chinese think it’s a weed and avoid it. The Chinese KNOW herbal medicine. Oil di olivia makes no permanent change in scarring. There is no medical evidence it works to reduce scars. Scar fading is the number one goal of scar patients, especially people who have had plastic surgery. The doctor promises a tidy scar. He can’t be certain it will be. He can’t promise it won’t turn colors. Reducing color makes a mark look smaller. Scar fading gives the appearance of a flatter scar. Facial fading treatments can ease embarrassment. Silicone is proven effective for fading. The plastic surgeon tried to hide his handiwork. Your facial scar may be at the hairline. Or under the ear. If it heals red, or purple, or multi-colored, it becomes obvious. Tummy tuck scars, and breast reduction or improvement scars can’t be hidden well. An effective scar fading cream can be part of “managing” those scars. Also, you can’t know for a year to eighteen months just how much your plastic surgery mark will fade. That’s how long normal fading takes. Until then, people can see you “had work done”. Silicone was once used to moisturize scars. By accident doctors realized it shrinks tissue and fade redness. Of course, a shrunken scar is also less noticeable. Silicone works to reduce scar size. - Keloid - Hypertrophic scars. - Breast implant & reduction scars. - Tattoo Removal & Body. SCARprin™ uses a proprietary blend of ingredients to help combat the effects of scarring including helping reduce the pain, redness, and swelling associated with a scar. SCARprin™ is composed of 100% silicone. However, unlike typical silicone scar treatments, SCARprin™does not use bulky, awkward sheets of silicone, but rather allows users to place a small amount of the silicone gel directly on the scar. After just a few minutes of applying SCARprin™, the gel will absorb and any excess can be dabbed off the area (may not fully dry), which will allow the user to go about their normal day without worrying if anyone will notice that they are using a Scar treatment. In addition, the user may apply make-up on top of the treated scar without affecting the effectiveness of SCARprin™. - Forms a protective, flexible silicone barrier over the scar area protecting it from natural elements. - Allows the scar to retain moisture from the surrounding, healthy areas of the skin thus helping the scar heal more quickly. - Keloids (Keloid scars often expand beyond the original area of the scar). - Hypertrophic scars (Hypertrophic scars may also expand, but are limited to the original boundary of the scar). - Surgery scars (These scars develop from poorly executed stitches/staples, C-sections, and plastic surgery such as breast augmentation, tummy tucks, facial resurfacing scars, etc.). While some similar scar treatments do use silicone, they often use gel sheets or pads. While these products will provide a silicone barrier, they are inferior to using a silicone gel. This is because a product like SCARprin uses gel as opposed to silicone sheets or pads which allows the user to cover their scar using only a minimal amount of silicone gel. This in turn, will allow the user to save money by continuing to use SCARprin much longer than they would be able to by using silicone sheets or pads. In addition, the silicone barrier created by using SCARprin provides the user with the flexibility to go about their normal day without worrying if their scar is protected. This is because unlike silicone sheets or pads, the barrier created by using SCARprin will adapt to any movement as it will not loose contact with the scar. This is especially beneficial if the scar is on an area of the body which constantly moves such as a knee or elbow. Furthermore, SCARprin dries quickly allowing the user to cover the treated scar area with cosmetics or sunscreen. SCARprin does not leave a sticky residue like some cream based scar treatments, and will not stain clothes. It is best to apply SCARprin twice daily in order to receive its maximum effectiveness. In order to save our readers valuable time and money, our team has compiled a detailed list of the best scar treatment products available on the market. These products all contain ingredients which have been shown to effectively and safely diminish both the size and color of a scar. All of these products were reviewed and judged based on their ingredients, effectiveness, overall customer satisfaction as well as the manufacturer's claims. Ensure the scar area is clean and dry. Apply a thin layer of SCARprin™ to the scar area. Allow a few minutes for the product to absorb. Remove any excess gel to allow the product to dry (may not fully dry). Once absorbed, SCARprin™ can be covered with cosmetics, sunblock, and garments which will allow the user to go about their normal day without worrying if anyone will notice that they are using a scar treatment. SCARprin™ should be applied twice daily for maximum effectiveness. Ensure the scar area is clean and dry. Apply a thin layer of SCARprin to the scar area. Allow a few minutes for the product to absorb. Remove any excess gel to allow the product to dry (may not fully dry). Once absorbed, SCARprin can be covered with cosmetics, sunblock, and garments which will allow the user to go about their normal day without worrying if anyone will notice that they are using a scar treatment.SCARprin should be applied twice daily for maximum effectiveness. A: Yes, SCARprin™ is safe to use on adults as well as on children. It is also safe to use SCARprin during pregnancy. However, it is important to note, that SCARprin™ should only be used externally. 2. How soon should I see noticeable results? A: Our customers typically see results within the first 90 days of using SCARprin. However, depending on the age, size, and color of the scar, it may take longer to notice results. 3. Is SCARprin™ effective for all types of scars? A: Yes. However, you should not use SCARprin on an open wound. Some scars such as third-degree (open) burns will require medical intervention. 4. Is it possible to be allergic to SCARprin™? A: If you have a known allergy to silicone, do not use SCARprin™. We have never experienced a case in which one of our customers has had an allergic reaction to SCARprin™. If you do experience prolonged pain, swelling, or excessive redness or irritation after applying SCARprin™, wipe away the gel, clean the scar area, and contact a health care professional as soon as possible. 5. Can SCARprin™ diminish internal scars? A: No. 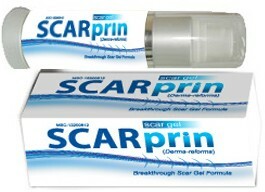 SCARprin™ only works for, and is intended to treat external scars. 6. How long should I continue to use SCARprin™? A: It is recommended to apply the product twice daily for 8 weeks or longer. If results are still noticed after this time, applications should be continued. 7. Will SCARprin™ ruin my hair or clothes? A: No. SCARprin™ will not ruin your hair or clothes. However, we suggest only using enough SCARprin™ to cover the scar. Once you apply the gel, wait for a few minutes for it to absorb. If it does not fully absorb after a few minutes, do not worry, and simply remove the excess gel. Applying a small amount of SCARprin™ will help prevent it from getting in your hair or on your clothes. 8. What is the shelf life of SCARprin™? A: Due to the fact that SCARprin™ is formulated without water and with 100% silicone ingredients, it will last approximately three years. 9. Will SCARprin™ treat acne? A: We have not tested SCARprin™ to treat acne. However, we have found that it is effective in reducing the appearance of acne scars once they develop. 10. How many applications can I get out of one bottle of SCARprin™? A: There is no concise answer to this question as the number of applications will vary based on the size of the scar. 11. How long should I wait after surgery to apply SCARprin™? A: Do not apply SCARprin™ to surgery wounds that are new/open. Wait for the wound to close and for all bleeding to cease. If you have stitches, wait for them to be removed prior to using SCARprin™. 12. What are the ingredients in Scarprin™? A: Scarprin™ is made with 100% silicones which are Dimethicone, Dimethiconol and Cyclopentasiloxane. 13. Do you offer a guarantee? A: While the ingredients used in Scarprin™ have been shown to diminish a wide variety of scars, we cannot offer a guarantee due to many factors such as age of scar, type of scar, severity of scar, and how the individual skin responds to the product ingredients, and most importantly if the product is applied as directed. 14. Does it lighten scars? A: Scarprin™ does not have any lightening agents in the ingredients so if you want to lighten any of the dark scar colors (if any) Scarprin™ will not help much with that. Because scars get dried out, irritated and itchy Scarprin™ helps to relieve those irritations which in turn helps to reduce the discoloration. For darker colored scars, you will need to search for a skin lightener. 15. Will Keloids go away and never come back? A: Once you have achieved satisfactory results, you should not have to use Scarprin™ any longer. However, if you notice any change in the scar after you have stopped use, start using Scarprin™ right away to prevent from the scar from growing. 16. How long does one bottle last? A: One (1) bottle can last about 4-6 weeks on a scar area about 2”-4” in size depending on the application amount of each use. Product : Scarprin. All Items are new set, and original imported from America. Price : RM150 / USD47 per bottle.